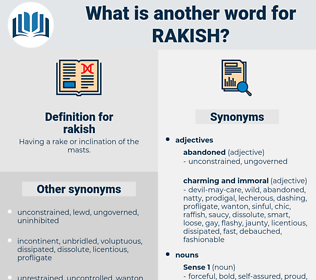 What is another word for rakish? Having a rake or inclination of the masts. unfashionable, uncorrupted, pure, righteous, principled, Uncorrupt, good, ethical, unstylish, conventional, honest, virtuous, incorruptible. With characteristic nonchalance he pushed his wideawake off his forehead for the sake of coolness, and in so doing tilted it very much on one side, which gave him a somewhat rakish air. An exceedingly reckless, rakish lot they were - this flower of the Mexican forces who the Viceroy was only too willing should explore all lands, and seas, so they kept themselves away from the capitol.